We love anything with curry and coconut at our house! So a few weeks ago I took a recipe a found at familyfun online and modified it from a salad to a dinner dish with rice! It was a hit! And very easy to make! I love summer recipes that are fresh and fairly light which equals feeling satisfied and not overly stuffed after eating!!!!! Divide the sauce/marinade in half. Put 4 chicken breasts in a gallon sized ziploc bag with half of the sauce. Let it marinate in the fridge for at least an hour. Set other half of the sauce aside! Bring chicken stock to a boil. Add the rice and reduce the heat to simmer. Cover the rice and cook for 15 minutes. Grill your marinated chicken while the rice is cooking. About 5 minutes per side over high heat! Add cubed mangoes after the rice is cooked. Throw prepared veggies into a large saute pan with the remaining half of the coconut curry sauce. Cook over medium heat until veggies are just slightly tender. About 5 minutes. Plate your dinner however you would like! 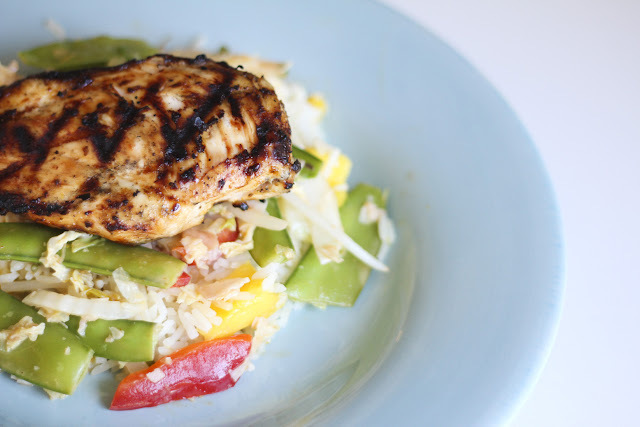 We did the mango rice on the bottom, followed by the cooked veggies and grilled chicken on top! Enjoy! Kar this looks and sounds amazing! Yum! Oh yum! I'm going to HAVE to make this!! ummm I want that! You gals always make everything look so delicious and simple! Oh my goodness I'm so glad you're back! I haven't checked your blog in awhile... Pregnant=minimal cooking but then I thought of your Angel hair with Tomatoes and Fresh Basil and I was flipping out when that strange site came up. I just kept googling and clicking and then when I'd almost given up there you were! I love love love your site and yummy recipes. Thanks for sharing! Mmm, coconut and curry - two of my favorite flavors as well. If I weren't feeling so lazy, this would be tonight's dinner. Maybe tomorrow!